There’s a steep ideological drop-off from current Democratic committee chairs and their Republican counterparts. 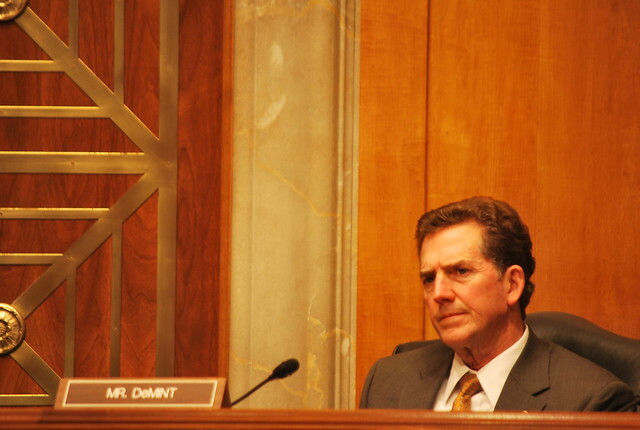 Senator Jim DeMint, who is in line to take over the Committee on Commerce, Science and Transportation. via Leadership Council on Civil and Human Rights. A year ago, a Republican takeover of the US Senate seemed inevitable. Democrats held only a four-member advantage, and would have to defend twenty-three seats—where Republicans only had to defend ten, many of them in completely safe states like Mississippi, Utah, Texas and Wyoming. Now, things are looking pretty dismal for the GOP, thanks in part to poor recruiting, and the epic self-induced flame-outs of Representative Todd Akin in Missouri and possibly Richard Mourdock in Indiana. Nate Silver gives the Democrats an 87.6 percent chance of retaining control of the Senate. A Republican takeover in the upper body would dramatically affect the country’s course over the next two, or possibly four, years. It would dictate what legislation and what nominees moved out of the Senate—or don’t. Committees are the key to how the Senate operates, as they must draft bills or send presidential nominees out to the whole Senate. Imagine, then, that Republicans control the committees and President Obama is re-elected—the administration would have an awful hard time getting any Supreme Court nominee with anything resembling a liberal résumé out of the Senate Judiciary Committee. That’s not to mention all of the other cabinet appointees Obama would need to make (replacing Hillary Clinton at the State Department, for example). If you think the GOP was good at bottling up nominations when they were in the minority, just wait. The résumé of the committee chairmen is particularly important—their ideological rigidity can greatly affect the details of legislation passed out by the committee, or the depth of intransigence to a particular nominee. So it’s useful to look at the bosses who would be running some key Senate committees should the GOP take over. In every case, there’s a dramatic difference between the current chair and the prospective Republican chair. In some cases, the ideological drop-off is absolutely terrifying. Committee on Armed Services. This is one of the most influential committees in the Senate. It has legislative oversight of the entire US military, including the Department of Defense and a wide range of the nation’s nuclear activities. It is currently chaired by Senator Carl Levin, who voted against the Iraq War in 2002 and helped push through the “don’t ask, don’t tell” legislation in 2010. (Unfortunately, Levin also helped push through the 2012 National Defense Authorization Act that included the indefinite detention provisions—which Levin defended.) Should the GOP take over, Senator John McCain would chair the committee—and he is on every measure much more hawkish than Levin. McCain previewed his potential chairmanship in an extraordinarily bellicose speech at this year’s Republican National Convention in Tampa, where he claimed that “people don’t want less of America. They want more.” He ripped Obama for withdrawing too quickly from Afghanistan, even though that is still two years off. He openly pushed for conflict with Iran (NBC News called it “a real bell-ringer for war”). He also seemed to push for a war with Syria—and in the past he’s called for US-led air strikes. He’s also a rigid opponent of defense cuts, and he would be in charge of crafting the Defense Department budget. Committee on Banking, Housing and Urban Affairs. This crucial committee is where the Dodd-Frank legislation was incubated in the Senate. (Senator Chris Dodd was chairman at the time.) Any repeal of that legislation—as Romney has pledged to do as president—would start here as well. If the law is instead implemented, the committee could have a lot to say about it. Moreover, the broader portfolio of this committee is supremely important, particularly over the next several years: it oversees the entire US financial sector, as well as private and public housing, monetary policy and international trade. Budget Committee. Paul Ryan made his name as chair of the House Budget Committee, but always had a Democratic chairman for his Senate counterpart. If Republicans take over the Senate (while retaining control of the House, which under that scenario they almost definitely would), they will be in a strong position to pass out the Ryan budget—and possibly have it signed into law by President Romney. What would be interesting about a Sessions chairmanship is that his deeply held drive to cut programs like Medicaid and food stamps might be seen in a different light than, say, Paul Ryan’s. That’s because Sessions (full name Jefferson Beauregard Sessions III) is, without much debate, an unreconstructed racist. A career Justice Department official has testified under oath that Sessions told him the NAACP is an “un-American” and “Communist-inspired” organization that “forced civil rights down the throats of people.” He has slammed the Voting Rights Act as “intrusive,” and an assistant US attorney has also testified that Sessions called him “boy” and joked about liking the Ku Klux Klan. Senate Commerce, Science and Transportation Committee. This is a truly frightening one. If the GOP takes over the Senate and Jay Rockefeller loses his chairmanship, the next Republican in line is Senator Kay Bailey Hutchison—but she’s retiring. So is the next person in line, Senator Olympia Snowe. That means the chairmanship would fall to none other than Senator Jim DeMint. But the “Commerce” part of this committee is even more important. “The Commerce Committee, I’m telling you, is like being a mosquito in a nudist colony,” John McCain once said. “You pick the issue you want and go after it. That’s commerce. Hell, what’s not commerce?” Indeed, the committee oversees many important infrastructure and transportation areas, regulation of interstate commerce, civil aviation, highway safety, marine fisheries, offshore oil drilling, even professional sports. DeMint represents the farthest-right viewpoint on virtually all these issues, and his default position is always to defund and deregulate. Committee on Environment and Public Works. This is another one where the drop-off between Republican and Democrat would be very steep. The committee is currently chaired by Senator Barbara Boxer, a dedicated environmentalist who has received the Sierra Club’s top honor and gotten perfect ratings from the League of Conservation Voters. The gavel, should Democrats lose, would go to Senator Jim Inhofe—who in 2003 called climate change “the greatest hoax ever perpetrated on the American people,” and went on to write a similarly themed book called The Greatest Hoax. (If the climate is indeed changing, Inhofe has argued, it’s the work of God, not man). Inhofe’s biggest campaign contributor by far is the oil and gas industry, from which he has received over a million dollars in donations since 1998. (Earlier this year, actor Alec Baldwin rather indelicately called Inhofe an “oil whore.”) Inhofe is in favor of virtually every oil-drilling project ever proposed—his theory is that “we can drill our way to energy security.” Be it in the Alaskan National Wildlife Refuge, offshore, on land, it doesn’t matter—Inhofe supports it. He opposed a drilling ban in the aftermath of the Deepwater Horizon spill and even tried to shield BP and other oil companies from increased oil company liability in the event of disasters like that. He also routinely votes against any federal attempt to regulate greenhouse gas or other harmful emissions, and is a dedicated foe of the Environmental Protection Agency, which he would oversee as chairman. Committee on Health, Education, Labor and Pensions. This committee touches a number of areas crucial to progressive domestic policy, and is currently chaired by one of the Senate’s stalwart liberals, Senator Tom Harkin of Iowa. His Republican counterpart, and potential future chairman, is Senator Michael Enzi of Wyoming—a low-profile senator but one with a terrible record on these issues. Eric Alterman writes that the mainstream media has ignored the radicalization of the Republican party. Want more debate coverage? Subscribe to The Nation’s 2012 Election mailing list.